Congratulations on the Big 30 Paul. These shows have come on in leaps and bounds and are full of interest for me. I just listened whilst waiting for my companion to pick me up and head out into the woods for an overnight trip. Not sure how much “bushcraft” we’ll do, but we’ll enjoy the environment for sure. Maybe we’ll do something a bit more skills based than usual now, not just because we can, but because you have set me thinking. I’ll report back in a day or two! Well our main objective was simply to get outdoors and see what was going on in the woods. It is a sessile oak and hornbeam wood, as many in south Hertfordshire are. The wood anemones are now over having put on a spectacular show in late April and the trees are in full leaf. Embryonic raspberries just beginning to show – locations noted for later in summer 🙂 So far so good. But did we ‘do’ any bushcraft? Well I did knock-up a grill from green hazel to cook our lamb-steaks on rather than use the metal grill from my “Honey Stove”. Not my best effort but I was trying out a different design. It did the job and some lessons were learned: as usual, keeping it simple is best! A green wood pecker came forraging within 5m of our camp which was nice to see close-up without binoculars and a pair of muntjac came close in the night although we couldn’t find any tracks in the morning. In the deep leaf-litter it is unusual to find any trace of them. They were there though as they were barking very loudly very close by. Anyone know if the apparent call and response is a mated pair or a territorial dispute? Thanks for the bivvy bag answer. Nikwax have been very responsive on Instagram. All my tapered seams came off even at 30°c synthetic wash with tech wash first then tx. Direct and cleaning draw out of old build up. They reckon as it’s old army surplus it got a build up of dirt and sweat (not mine) and glue dissolved. Damn. I can buy glue and seam strips though to repair,do that’s good. Paul when the phrase bushcraft was first used i got it it it was a whole scope of knowledge to aspire to .it has become a platform for idiots talking about how great old 58 patt webbing is for bushcraft and how you need 2 axes 4 knives etc for an overnight .anyone who has been outdoors for any length of time knows its about using different ideas and knowledge to suit your outdoor needs with the minimum clutter and fuss. -my answer to your critics. PS Only buy a real Gurka Kukri knife-not a reproduction! Another wonderfully lucid and honest ‘q and a’ session – many thanks. I was particularly taken with your response to the last question about kit. You are, of course perfectly right: bushcraft is something we do; kit is something we possess. The confusion arises from retailers and manufacturers labelling things as a ‘bushcraft saw’ or a ‘bushcraft knife’. It leads to all sorts of confusion, including the idea that, if you spend more on, say, a knife, it’ll make you better at bushcraft. This is inherently untrue: only practice will make you better; it has the added advantage of raising your understanding and appreciation of your surrounding at the same time. I really appreciate your insights into this amazing pursuit. Keep up the great work! Well in fairness you did point me towards the 20 free videos but that’s not worked for me unfortunately as even though I do get regular emails from you letting me know about new content on your blog I’ve never received the link(s) for the free videos (I’ve popped my details in a couple of times). I think I’ve watched a fair few of the 20 videos by searching YouTube and spending a bit of time on the FrontierBushcraft site but haven’t come across the one pertaining to taking a nature stop while out in nature. I think I’ve got a good system down for my toilet activities but for some reason I feel like I could be missing something… so thought I’d ask. 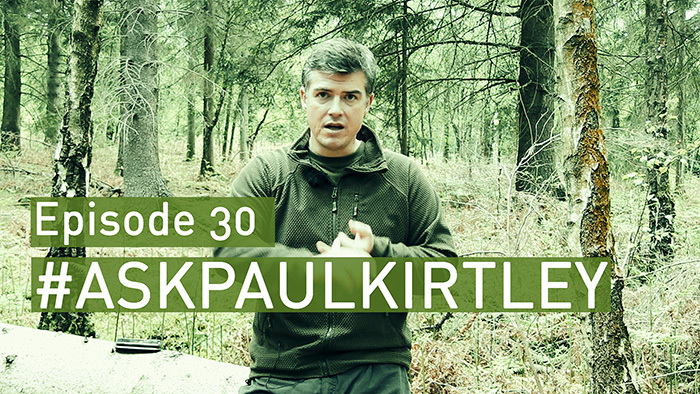 I’m exceptionally grateful for all the advice and knowledge you are handing out and look forward to new blog posts and #askpaulkirtly episodes so please don’t take my comments above as being moan-y. When I was younger my ability to spell was rather lacking; I was given a dictionary to look up the words I couldn’t spell – trouble was I either didn’t know I couldn’t spell them or if I figured I couldn’t spell them, I couldn’t look them up because I couldn’t spell them. So while all the words and all the information was right there in that dictionary I was more often than not unable to access the solution to my problem. Perhaps I will forever believe my pooping system is correct because I have a little knowledge much as I know that ‘I’ always comes before ‘E’ except after ‘C’ – which is wEIrd. Like I said all the knowledge is out there I just can’t use a dictionary… Or Google apparently ! Great, just got to watching the video and I’m not missing anything… Phew! Round here we explain things in a very similar fashion. An owner who can get it sharp. An owner who can keep it sharp. An owner who understands what he’s using enough to use it well. Finally, a reasonably pointy point. This means that any time someone says that this knife or that knife is rubbish, there’s a 75% chance the failure is infact, due to pilot error. Keep up the good work. Cheers, And. Hey Paul, thanks for answering my question about knife care and storage. I will make sure the blades are clean, dry and lightly oiled before putting them away and also make a habit of checking them every couple weeks to ensure the environmental conditions haven’t had any detrimental effects on them. Cheers, Matt. Thanks yet again for a great episode – you don’t proselytise, you speak from the heart of experience. You are so right that, sadly, “Bushcraft” has become something else – in my opinion, yet another marketing tool. This may be okay as far as perhaps helping to raise the profile of the activity, and possibly maintaining excitement among one of the most recent manifestations of the train-spotter type; however, it is tending to smother the core reason for bushcraft. I am a bumbling soul, hoping to be able to share the delights of the wild with my future grandson. With my teacher daughter so in favour of forest education, I am confident that he will grow up with the kind of natural knowledge I never had. We can all keep learning throughout life – thanks again for your practical wisdom. Yes, there is always more to learn. It sounds like your grandson is in a great position to learn from you and your daughter. I have had some thoughts and discussions with others on the “what one thing would you choose” question that you often get when teaching courses. I agree with you that there is no one answer, one answer that has been offered by some experienced people here in Sweden is “a sleeping bag” (wool blanket, etc). The logic is pretty good: if you can’t get a good nights sleep you will not have much ability to do something to improve your situation. A sleeping bag will naturally make it much easier to get some sleep, and when you are rested you much more likely to be able to get fire, water, shelter, etc sorted. We have both probably seen people who have not gotten any sleep, and their capabilities are severely limited. Another good milestone with another good video. When I was young we learnt to camp and use camp skills. I was taught how to catch animals by a local poacher (in the Lake District). 30+ years ago the military taught me survival skills. All of the stuff used equipment but the equipment was just a means to an end. At my age the end is enjoying being outdoors although now (thanks to Spoons and yourself) I do seam to have an unhealthy obsession with carving spoons! On the “one item” question, mine would be a Kukri. Why, because I was taught to use one 30+ years ago and have used them ever since so it is the best tool for me. And that has to be part of the question, it is the tool that I am most familiar and comfortable with. On the canoe exped skill course, Paul demonstrated that he is better with an axe than I am with my kukri but a tool is only as good as the user so until my axe skills improve I will say kukri for me. It’s good to hear from you. And it was good to spend the week with you in the Lakes. You are right to point out that familiarity and skill with a particular tool are important. The efficient (and safe) use of a tool are down to the user. Glad you are enjoying the videos.